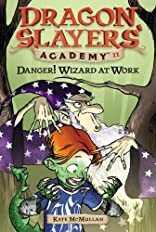 When Wiglaf and his pals from Dragon Slayers' Academy meet up with the wizard Zelnoc, all they ask is for a little magic to help them get through the Dark Forest fast. But unfortunately, Zelnoc's spells always end with an "Oops! Sorry about that!" So, yes, the boys are able to travel much faster now...but that's because they have wings, can fly, and have been turned into dragons! And they become the newest students at Dragon Slackers' Academy, a school that teaches knight-slaying! This funny turnabout in which the kids from DSA suddenly see life from a dragon's point of view makes a wonderful addition to this popular series!